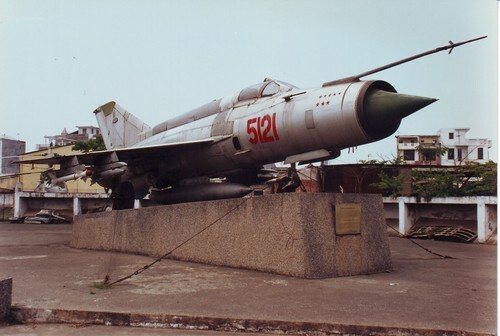 Vietnamese MiG-21MF displayed in Hanoi. Pham Tuan, Vietnamese Air Force pilot and the first Vietnamese astronaut, was the only person able to down an American B-52. He did that on this plane. Syrian Air Force MiG-21US pilot died after the plane was downed in Hama province, the second pilot successfully catapulted, Syrian military source specified to Sputnik news agency. Earlier a source in the Syrian army informed that militants downed the MiG-21 fighter jet near the air field in Hama province and murdered the pilot while he was parachuting. “After the Syrian Air Force plane was downed, one pilot catapulted and landed in the al-Magir village controlled by the army. The second pilot attempted to land the plane on the military air field in Hama. The landing didn’t succeed and the pilot died,” the source of the news agency said. This entry was posted in News from the Middle East and tagged Syria. Bookmark the permalink.